Missouri University of Science and Technology's Solar Decathlon 2005 entry, Prairie House (left), is now located next door to the 2007 Solar House (right) in the university's Solar Village. The University of Missouri-Rolla—now called the Missouri University of Science and Technology—built Prairie House for its second U.S. Department of Energy Solar Decathlon. 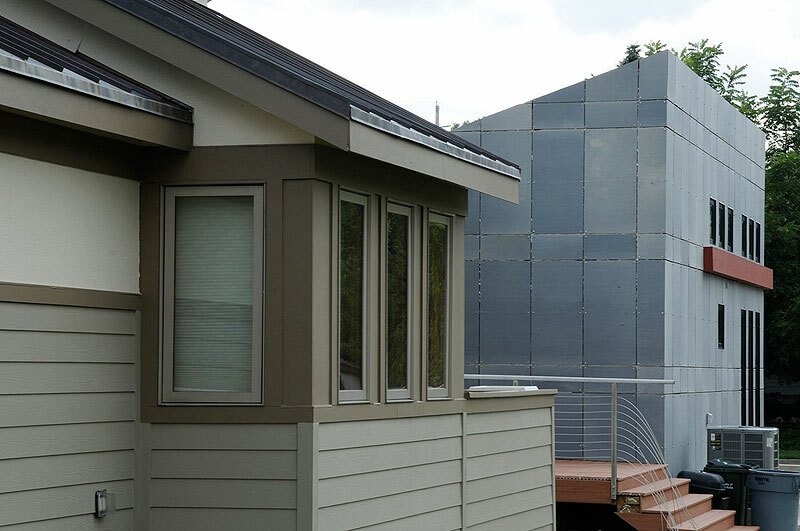 Designed with a long-term plan, the 2005 house is now one of four former Solar Decathlon houses used as rental property in the university's Solar Village. Prairie House was deconstructed and shipped back to campus within 72 hours of the competition's end. It then went into winter storage as the 2002 house had done. Once the ground thawed, students went to work building a foundation and adding a basement that could serve as a control center for the house's technical systems. In August 2006, the students slid Prairie House into place using the pulley and come-along system they developed for setting a house on the National Mall without a crane. A Solar Village open-house celebration took place in October 2007 as the university's third house returned home from the National Mall. By that time, student residents were already living in the 2002 and 2005 houses. Both units were connected to the national power grid to enable the sale of excess power to the local utility company. Any student enrolled at Missouri University of Science and Technology can apply to live in the Solar Decathlon houses. Priority is given to those students who were directly involved in the projects and those who participate in another design team. While student residents enjoy the benefits of solar-powered living, the rent collected from Solar Village houses helps recoup the cost of participating in the competition. "We use every opportunity to show people that it is possible to live comfortably in an 800-ft2 solar home," says Bob Phelan, manager of the Student Design and Experimental Learning Center that supports university design teams. "The student residents have been great about allowing access to tour groups." Phelan says they are planning to offer mutual tours with nearby Washington University in St. Louis, which is retrofitting existing buildings on campus with solar technology.